You’re just starting to think about buying summer sandals, right? Well, I’m working on a guide for you (to be posted later this week) but in the meantime, I thought I’d tell you about a great new brand I discovered at London fashion week that just so happens to do fabulous flat leather sandals. Havva, named after the designer herself – Havva Mustafa – is a a lovely little brand. I met Havva at London fashion week, and she told me about her family’s long history in shoes (both her father and grandfather were cordwainers). She certainly seems to know what she’s doing too; the shoes I was looking at (or rather, stroking longingly) were for a/w2014, but I can tell you they were BEAUTIFUL quality. You’d usually expect shoes like this to be very expensive, but hers come in around £150 or less, which is an amazing price for such a high end product. Plus this is still an under-the-radar brand, so if you buy a pair, you’re unlikely to see someone else wearing them, rather just get admiring glances and compliments on your brilliant find. 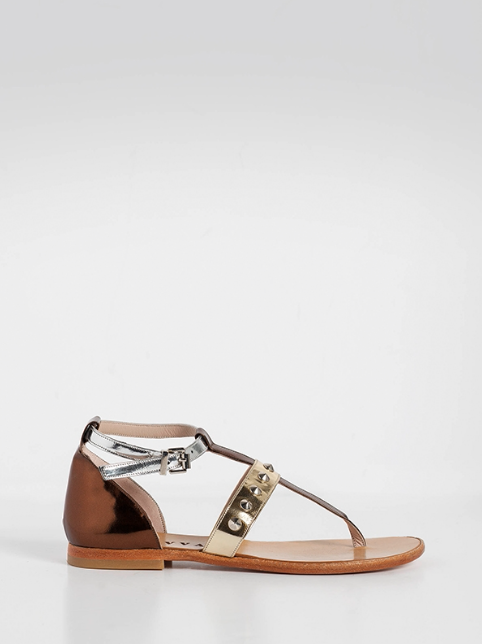 There’s a distinctly gladiatorial feel to these sandals; they’re perfect if you want to make a statement on your feet. But the black sandals are still subtle enough to be really practical too (perhaps to wear to work) and the metallic styles would be great for an occasion like a wedding. Remember, check back later in the week for my summer sandals guide!